When setting up double drapery rods the only extra peace of hardware that you will need to purchase is a double curtain rod bracket. Many people have the misconception that for double curtain rod applications they will need to purchase expensive specialized curtain poles, but this is not true, as you will be using two regular curtain poles, which will be placed inside the double curtain rod bracket. It is truly that simple! 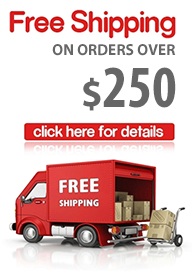 Another thing to keep in mind when purchasing hardware for double curtain rods, is to purchase end caps for the rear pole, and decorative finials for the front pole. Drapery Curtain Rods carries a large assortment of matching curtain pole end caps for double curtain rod applications. 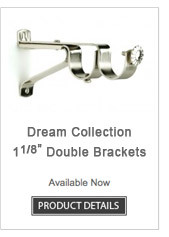 Drapery Curtain Rods carries a large assortment of double wall brackets. 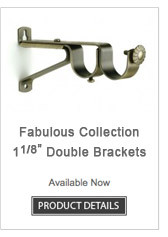 Most drapery hardware collections that we carry have many beautiful double wall brackets that match the specific poles, finials, rings & hardware that you wish to purchase. 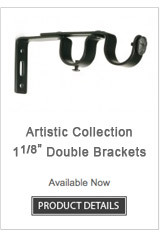 If you are interested in setting up a double drapery curtain rod simply purchase the double wall brackets instead of the single wall brackets when purchasing your brackets, purchase one pair of end caps for the back rod, one pair of regular decorative finials for the front rod and an extra curtain pole since you will need two poles for double curtain rod applications.